Quebec's Public Security Ministry says that 311,451 of the province's 1.6 million non-restricted firearms have been registered, with just two weeks left to complete registration. Quebec's Public Security Ministry says that 311,451 of the province's non-restricted firearms, which include hunting rifles, carbines and other long guns, have been registered so far. 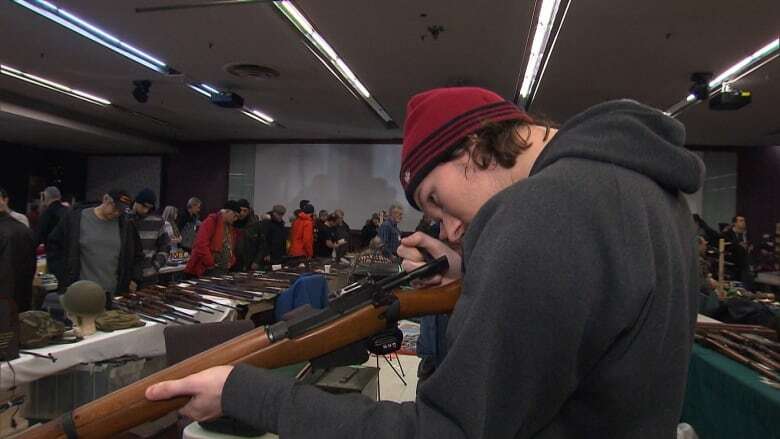 Ministry employees were at a gun show this weekend in Longueuil, south of Montreal, providing information and paperwork to gun owners so that they can register by the Jan. 29 deadline. Firearms can be registered by mail or online. The process is free. Once the weapons are registered, gun owners will have 90 days to affix a serial number to them. 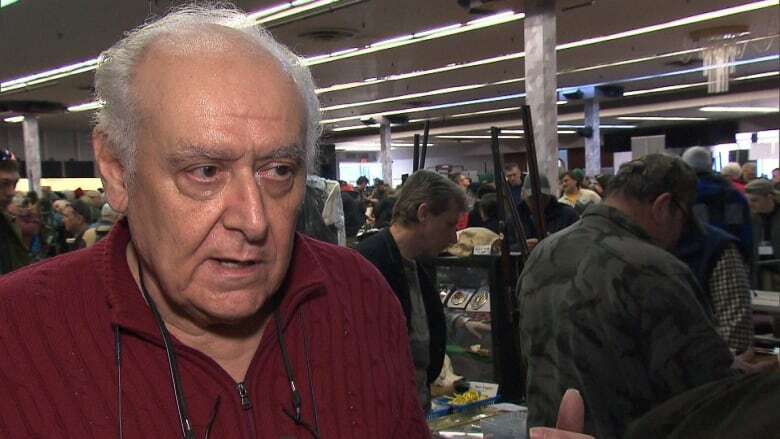 Steve Torino, the director of security for the Lower Canada Arms Collectors Association, which put on the exhibition, says that the percentage of gun owners in compliance is likely even lower than 19 per cent. Gun dealers, he says, account for a large share of the firearms already registered. He also estimates the number of firearms in Quebec has risen to about two million since the federal registry was scrapped six years ago. "It's already been tried once," said Torino of the registry. "It didn't work and it cost them an enormous amount of money." His organization, which is made up of collectors and focuses on historical firearms, is encouraging gun owners to comply with the new law. But he says he also supports the efforts of groups such as the National Firearms Association, which is lobbying against the law and is calling for gun owners to wait until the last minute to register their guns as a means of protest. Other gun owners have taken to social media to call for a complete boycott of the provincial registry. "You're targeting the wrong audience," said Torino. He argues that people using guns for criminal purposes will not register their weapons anyway, and that gun owners already undergo a thorough federal licensing process. Guillaume Harmant is currently going through that licensing process. He said he didn't have much of an interest in guns until he joined the Royal Canadian Air Cadets. "It's a sport. It's an outdoor activity like anything else for me," he said. He says those in favour of a provincial registry are likely not informed about the background checks involved in getting a firearm licence in Canada, and are instead thinking about the relatively lax gun laws in many U.S. states. "I think it's a safe process," he said. But once he's legally able to own a gun, he plans on registering his firearms with the Quebec government. "Yes it is a really dangerous object. It is designed to kill things. But registering the firearm doesn't make it more safe," he said. Those who do not register their firearms by the deadline can face fines of up to $5,000. Gun-control advocates, such as survivors of the Polytechnique shooting of 1989, are urging the provincial government to enforce the law once it goes into effect at the end of the month. They argue the registry will help law enforcement learn more about where guns come from that are used in violent crimes.